Chemanex a member of CIC Group of Companies, will link up with a leading chemical company in USA making an investment of Rs 350 million shortly. Chemanex Managing Director Lal De Alwis said that the company has shown a growth in exports at present and it will introduce a new chemical product range with the latest investment. The signing of agreements has been already completed between the two companies. The Thailand Trade Representative (TTR) will support small and medium-sized Thai construction companies seeking business opportunities in Sri Lanka, which requires investments of US$ 23.52 billion from now until 2017. The Colombo bourse closed low yesterday as both indices continued to descend. The Colombo Stock Exchange (CSE) All Share Price Index (ASPI) closed at 7,008.06 points moving down by 24.54 points, while Milanka Price Index (MPI) closed at 7,240.04 points down by 61.05 points. The daily turnover was over Rs 3.1 billion. 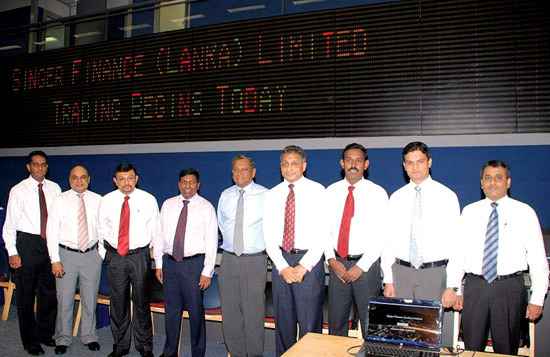 Singer (Sri Lanka) Chairman Hemaka Amarasuriya, Singer Group CEO Asoka Peiris and Singer Finance (Lanka) CEO Shantha Wijeweera with other officials at the Colombo Stock Exchange when trading began yesterday.